Ralf Jean-Pierre in What Should Be the Fear. 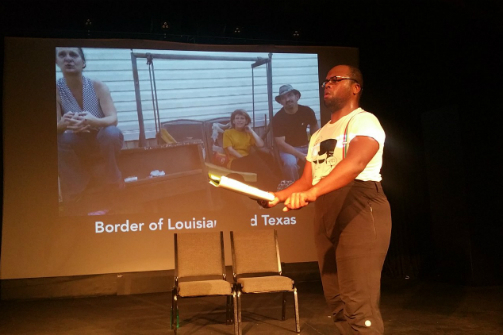 BOTTOM LINE: After more than 4000 miles around the U.S. on his bicycle performing Shakespeare on the street, Ralf Jean-Pierre is ready to tell his story in this heartfelt performance about loss and conquering fear. Pilgrimages are often for poets and lunatics. You go on a pilgrimage, sometimes calling it a hero’s journey or quest, to prove something, or in search of certain answers to an uncertain question. It is, for the most part, a solitary endeavor. It is also, more often than not, an escape from something you dare not face. For Christopher McCandless (Into the Wild) that escape was Anchorage, Alaska; for Cheryl Strayed (Wild) it was the Pacific Crest Trail; and for Ralf Jean-Pierre it was 4000 miles around the continental U.S.
A lone black man from Brooklyn, paddling his bicycle Grace, performs scenes from Shakespeare on the streets to anybody who would pause for a moment and pay attention. At least that was the idea. Jean-Pierre was not a trained cyclist, at least before he made his hesitant start in Florida, nor was he well-versed in living under a dome of stars. “I was never supposed to be the scout” is the first verse as the rapper/performer starts the show. He's accompanied by Omar Haddad on guitar, who channels Eddie Vedder, possibly as a homage to Into the Wild, the film that inspired Jean-Pierre in the first place. In the same style of his one-man street Shakespeare, What Should Be the Fear showcases the performer's skill in portraying a menagerie of colorful characters in a minimal setting. Two rehearsal blocks and some simple projections bring the audience on the artist’s not-so-smooth journey from Florida to the west coast and back to New York City, over the course of almost a year. We meet the reluctant dinner guest who becomes enthralled by Jean-Pierre’s retelling of King Lear in a southern twang. We meet the strip dancer who points out how lonely King Henry IV seemed to her. We meet Jean-Pierre’s mother, who calls her son on the phone to check in. There’s the old man in the nursing home who was so moved by how special it is for the performer to put on an entire show just for him, and Cassandra, the French tourist with whom Jean-Pierre almost fell in love. Like any pilgrimage, there are obstacles and rocky stretches, as well as moments of weakness when the hero succumbs to temptation or the call of temporary comfort. Quitting is often easy; it’s sticking it out that’s hard. A pilgrimage is about conquering fears, and for Jean-Pierre those were uncertainty and loss. The piece, as well as the bicycle tour itself, is dedicated to the artist’s best friend who had passed away. What Should Be the Fear is the fruit of labor and true experience, which makes this relatable piece honest, poignant, and ferociously funny. Jean-Pierre combines gritty realism with poetry, which comes in part from his strength in the musicality of Shakespearean literature. This is a piece for anybody whose soul aches for a transformation. What Should Be the Fear is written and performed by Ralf Jean-Pierre. Directed by Jolie Tong. Music Direction and Accompany is by Omar Haddad. dramaturgy is by Manuel Simons. Movement Coach is Katie Proulx. Projection Operator is Maria Kim. Producers are Chris Carr and Melissa Hunter Gurney.